Radio host Hugh Hewitt spoke with Sen. Tom Cotton (R-AR) Tuesday about the surprising "scurrilous attacks" on CIA Director Mike Pompeo's wife Susan, who is accused of having an "unusually active role" at the agency. The Washington Post's Shane Harris and CNN's Jenna McLaughlin were the first to raise concerns. 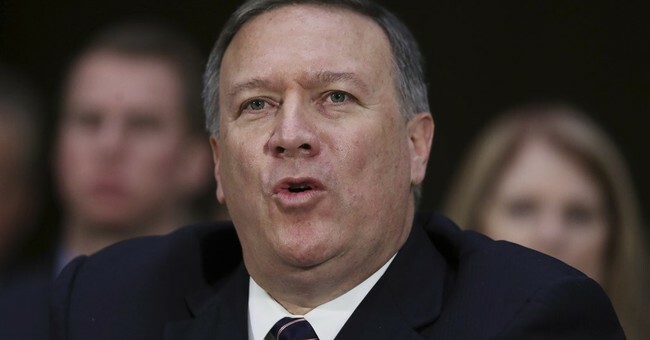 Mrs. Pompeo is a frequent presence at the headquarters in Langley, VA, even "adopting a permanent residence upstairs." Just as alarming, she often travels with her husband, and attends agency social events, McLaughlin noted Monday. The CNN piece offers a brief history of the role former CIA spouses have played at the agency, particularly Mrs. Jeanine Hayden, married to CIA and NSA Director Michael Hayden. Mrs. Hayden served as an emissary to families. She was given a secret level clearance, but the agency was careful not to give her access to sensitive intel. Mrs. Pompeo too has a secret clearance, but critics say she is given much more control over her husband's schedule. Mrs. Pompeo is "beloved by the CIA family," Hewitt noted in his chat with Cotton. Why the attacks? The senator offered the following explanation. Hugh, those two articles are the worst kind of resistance fan fiction that are based on no facts whatsoever, simply on feelings. I mean, CNN has assigned a 25 year old Mother Jones reporter to launch an attack on Susan Pompeo, who as you say is widely respected, even beloved inside the Agency. She is the honorary chair of the Family Advisory Board. She travels with Mike to address family issues, because CIA officers often face unique stresses for family members not like our foreign service officers, like our military, they’re often deployed overseas for long periods of time, often times in dangerous or austere environments. But second, unlike those people, they often can’t even discuss why they’re there or what they’re doing so. And I think both of these stories in CNN and the Washington Post refute themselves. I mean, they report on a few unnamed sources who have, you know, their feelings and perceptions. But then the fact of the matter is that Susan’s role is exactly like the role of the wives of past directors to support family members and to make sure the Agency is taking care of them. Cotton added that, unlike Mike Pompeo, who is tasked with protecting thousands, the journalists at CNN and The Washington Post have probably never "had the responsibility for a single life in their hands." The debate over Mrs. Pompeo's influence at Langley may be short-lived, as her husband has been nominated by President Trump to replace Rex Tillerson as the next secretary of state.